Any idea what I’m going on about? Munro bagging? 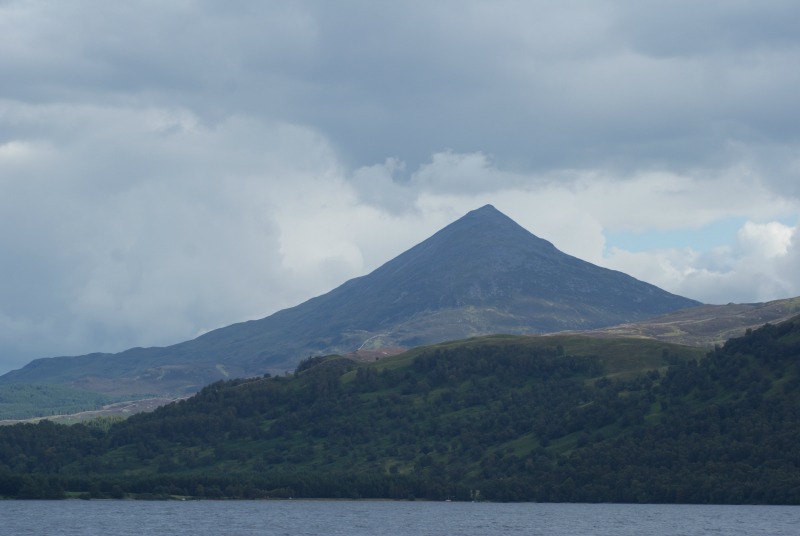 Schiehallion? It’s all to do with an incredible day we spent climbing a Scottish mountain. Something we had dreamt of doing for a long time and actually went for on one of our days off from our Helpx stay in Aberfeldy. In Scotland they have their own names for virtually everything and the mountains are no different. 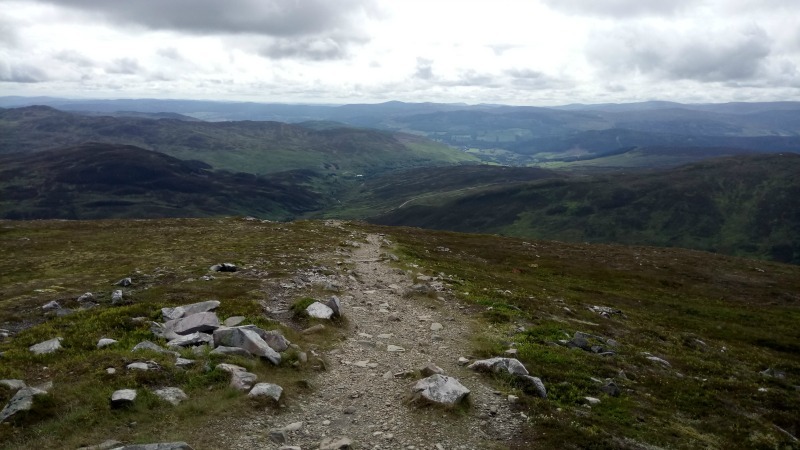 Any peak higher than 3000 feet is called a Munro, named after Sir Hugh Munro who produced the first list of these mountains in 1891 called ‘Munro’s Tables’. Officially there are 282 of these peaks. 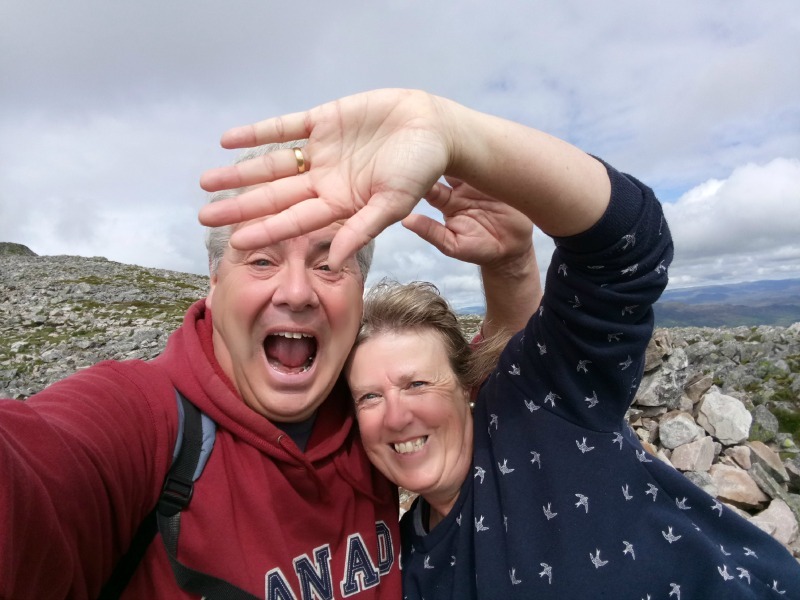 This the act of successfully achieving a climb to the top of a Munro (i.e ‘bagging it’). 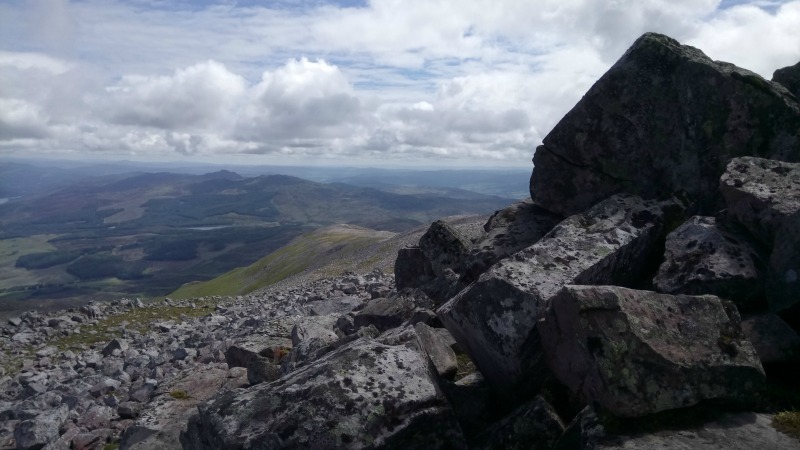 Bagging all 282 Munros is a serious challenge that thousands of climbers and hikers attempt every year. Currently it is estimated that over 6000 people have bagged them all which apparently gives them the right to be known as Monroists. Unbelievably the record for completing them all is held by Stephen Pyke who completed all 282 peaks in under 40 days in 2010. Unbelievable. The ‘Fairy Hill of the Caledonians’ is one of the Munros standing at an impressive 3,553 feet high. It sits between the three lochs of Tay, Tummel and Rannoch and is often known as the Centre of Scotland. So enough explanations and onto our adventure. 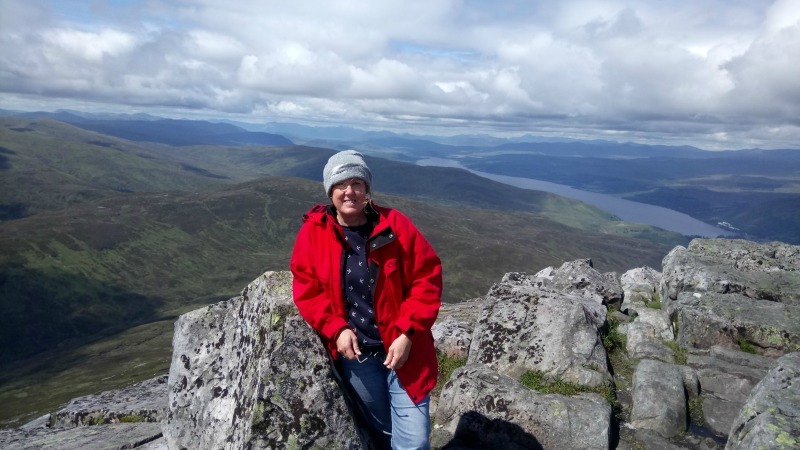 As soon as we’d settled in our lodge in Aberfeldy all those weeks ago we had our eyes on Schiehallion and wondered if we would get a chance to climb it. Luckily last week on our day off we woke to clear skies and decided that we would just go for it so packed a rucksack with wet weather gear, extra layers of clothing, ham sandwiches, biscuits, and enough water to float a battleship (well a couple of big bottles). All we knew really was where to park and that the hike up would take around 3 hours with another 2 hours to get down. No problem, probably. 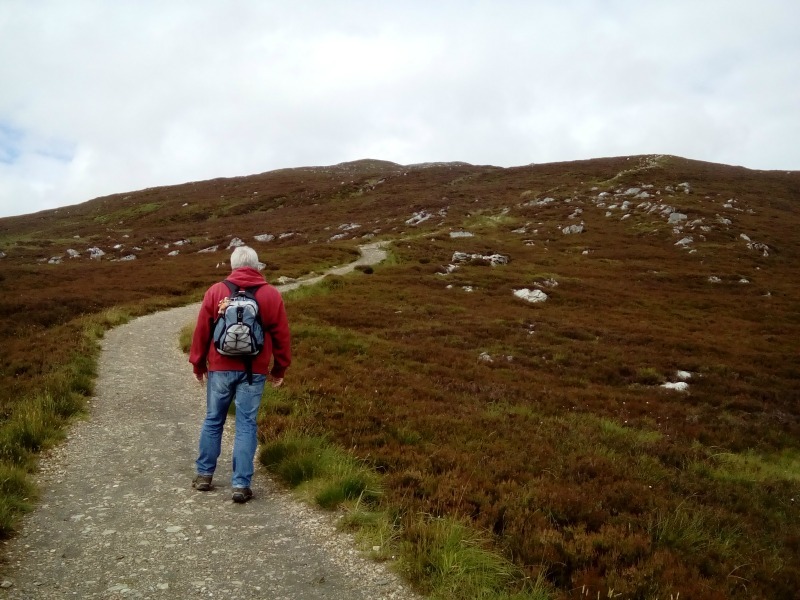 Set off from the empty Brae of Foss car park at half past nine across the shallow sheep pastures on the south east side of the mountain. Within about 20 minutes we were huffing and puffing our way up the seriously steep path wondering what on earth we’d let ourselves in for. We’re pretty fit and used to a lot of walking but the next half an hour was tough on our calves and lungs and there wasn’t a lot of chatting going on as we pushed on upwards. After what seemed like hours of my calves being on the verge of exploding out of my legs we reached a gentler slope and took time to appreciate the view and sunk some water. From here the climb was fantastic. Views on three sides of us and the peak rising majestically ahead, we were making great progress and wondered what all of this ‘3 hours up’ malarkey was all about. Unfortunately we’d fallen for Schiehallions first trick, the false peak. As we reached the top of our steep climb and walked out onto the top we saw the actual peak rising again in front of us. 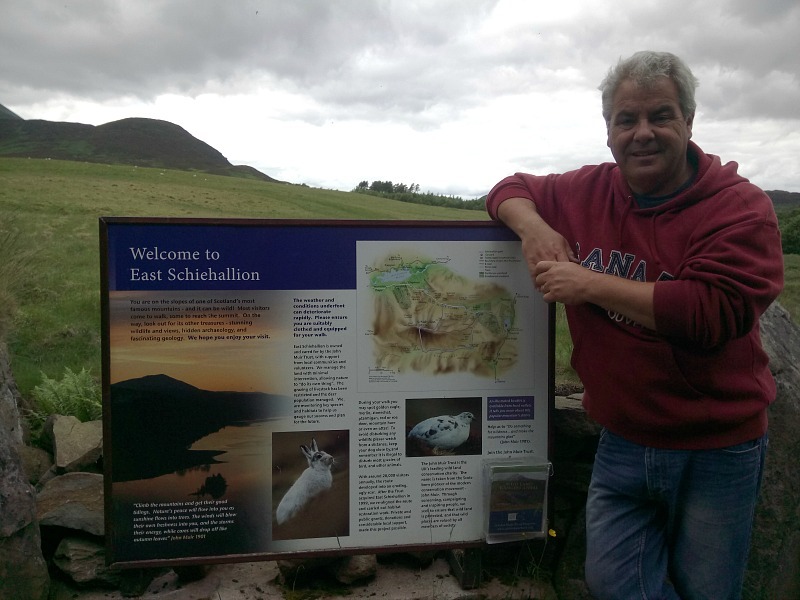 A cruel trick Schiehallion! This actually happened two more times as we thought we’d reached the top and discovered another slope to climb. Plus the wind was picking up as we climbed higher and higher so more layers had to be added. Depressingly we were passed by a young girl running to the top of the mountain as we trudged. We watched her disappear into the distance and then met her again as she ran past us on the way down. We didn’t like her at all, made us feel a bit hopeless! The final ‘actual’ peak looked immense as it rose steeply upward but the real scary part was that it was completely covered by rocks of all shapes and sizes. 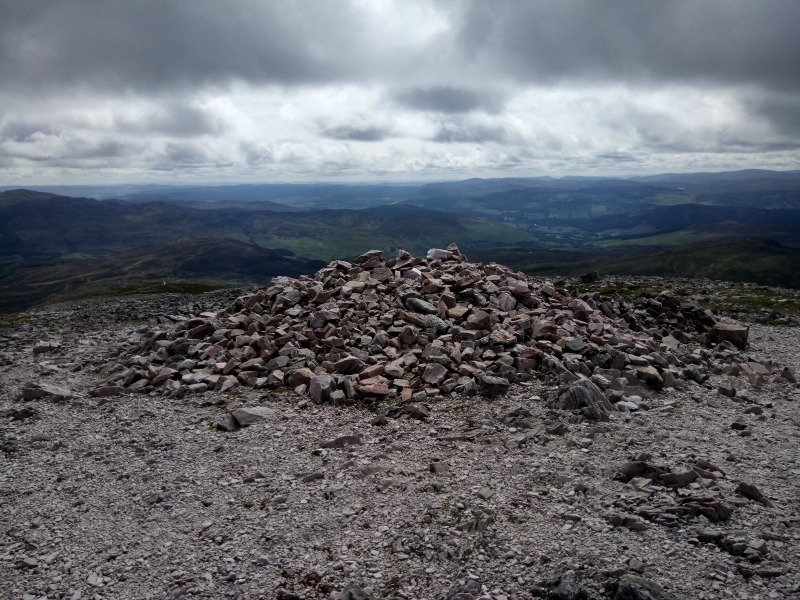 The top of Schiehallion is one massive rock field which you just have to clamber and climb over. It didn’t look that far but it was such slow going as every step was a challenge and we had to check out footing and balance continually. Took us another hour to climb the rock field before we reached the hallowed peak (bit dramatic). Although shattered by the hour of rock clambering we felt elated to be finally at the very top and the 180 degree views were just breathtaking. It was fairly windy at the top but we ventured onto the very edge of the peak to get a sense of height and perspective which was awesome. Jo was incredibly brave as she isn’t a fan of heights but pushed herself up to the peak. Time for a sandwiches obviously so a picnic sheltering from the wind and then time for our descent. In some ways it was more difficult crossing the rock field on the way down as we couldn’t always see the height or shape or the grey rocks beneath our feet. We lost count of the number of times each of us stumbled or slipped on the edge of one of those monster boulders and we relieved to finally get down to the gentler slope beneath the rock field. On the way up we’d passed only three people going the opposite way but now it was later we were passing many more. 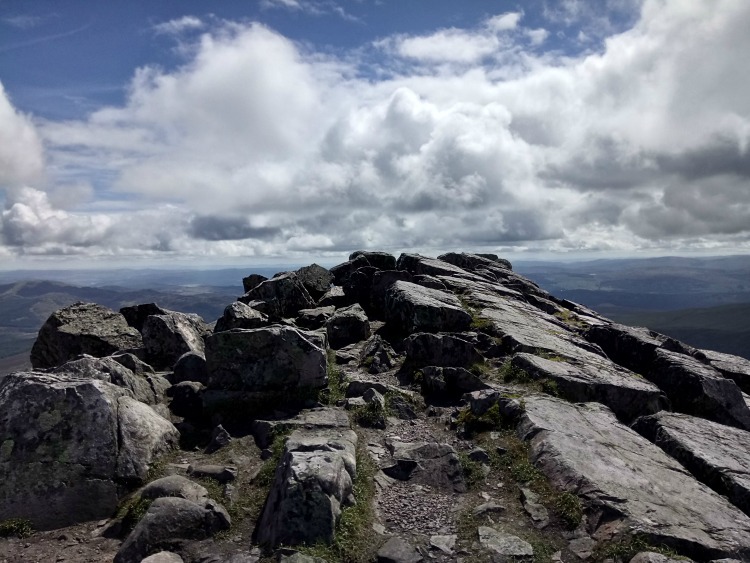 It seems as if the good weather had prompted people to get out and climb so there was a lot of ‘not far to go’, ‘you’re nearly there’ and ‘the views from the top are amazing’. 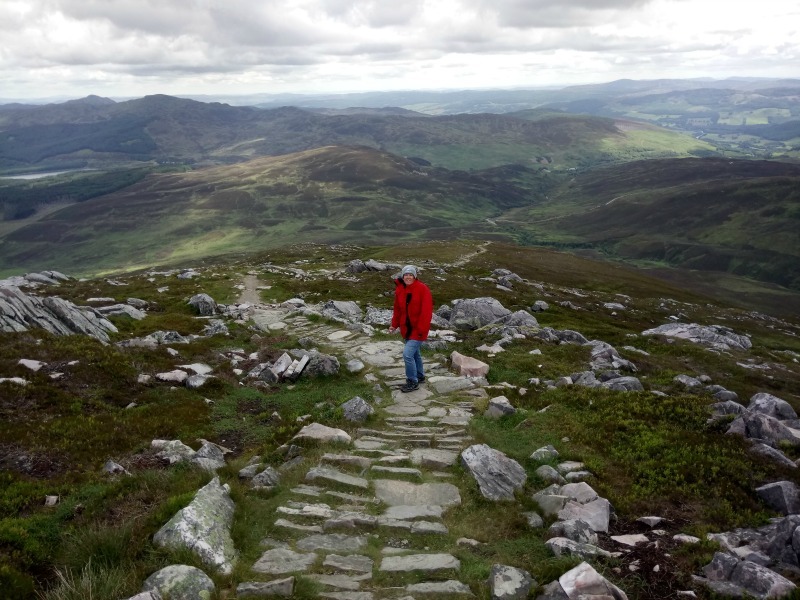 Coming down may have been quicker and easier but it played hell with our knees and ankles as the forward pressure of stepping down steep steps and climbing down over yet more rocks took its toll. It’s not an easy climb. We made the car park at the Brae of Foss almost exactly 5 hours after we and were both pleased to have completed it and sad that it was over. 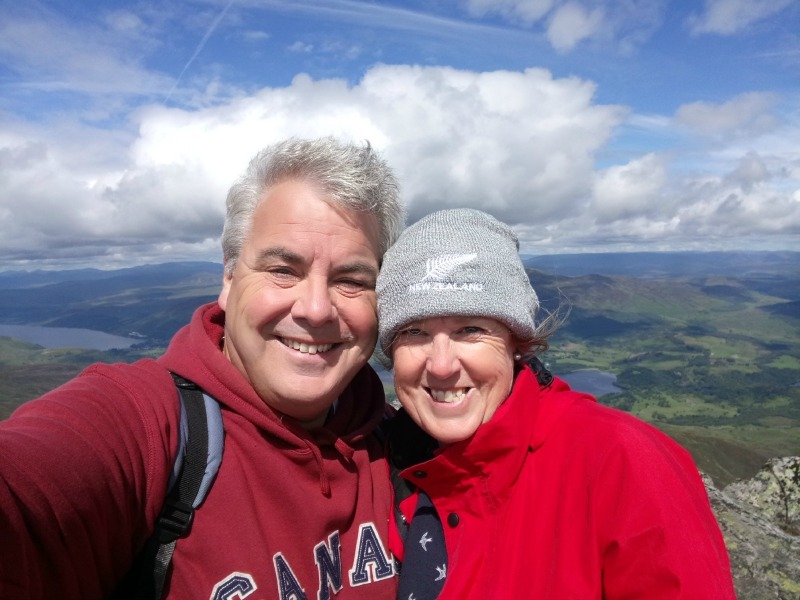 We’d bagged our first Munro. It could be our last of course but lets hope not. So mountains over 3000 feet are called Munros but there are a lot of other particular names for smaller peaks. The next group between 2550 and 3000 are called Corbetts, then there’s Grahams and Donalds and also Marilyns. Not sure if you bag a Marilyn or what? Next Guid cheerio the nou Caledonia! 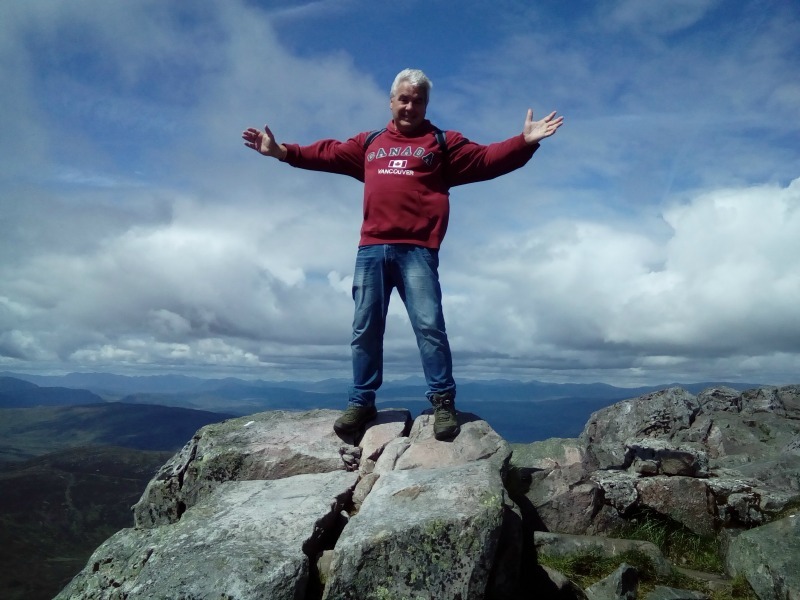 Congratulations on bagging your first Munro. 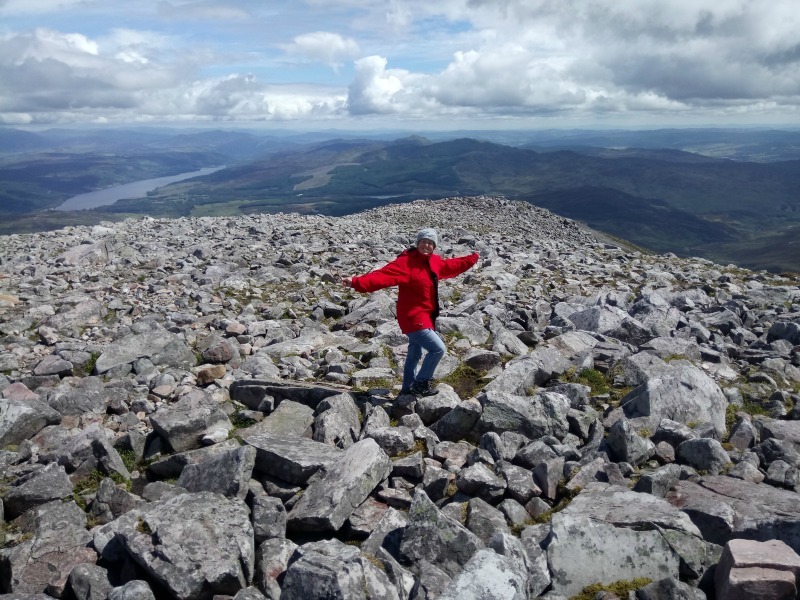 There’s plenty of them to choose from and the Scottish mountains are quite addictive. Thanks Misty, we loved it but not sure how many more there will be as we’re working so much. When the weathers good Scotland is amazing. Beautiful pictures!! You guys are an inspiration! Not for climbing, but for persistence! Glad you made it safely down, If you don’t kill yourselves, you should live forever! We had several moments that we thought we wouldn’t make it but once we’d started we didn’t want to stop. Felt muscles where we had no idea we even had muscles! But a great experience. Well done you two. Not sure I would like to do it, maybe one without the rocks on top. I recently had a fall [result only bruising on the side of my head!] so a bit cagey where I walk at the moment. Good feeling achieving and ticking off an “I want to do it” type challenge. Wonder what your next one will be? It was an achievement and another little adventure which is what we love. Only got a couple of days left unfortunately so no chance of any more. Hope your head is better now, doesn’t sound very nice. All good thanks and bruising has nearly gone thank goodness!! Brilliant stuff Jon. May just have made my Top 10 favourite blogs. I doubt Sir Walter Scott himself could have conjured up something quite so stirring. I’d love to do that but I doubt I’d get Ros anywhere near the top. So well done Jo but saying that it’s probably a bit easier for Hobbits! 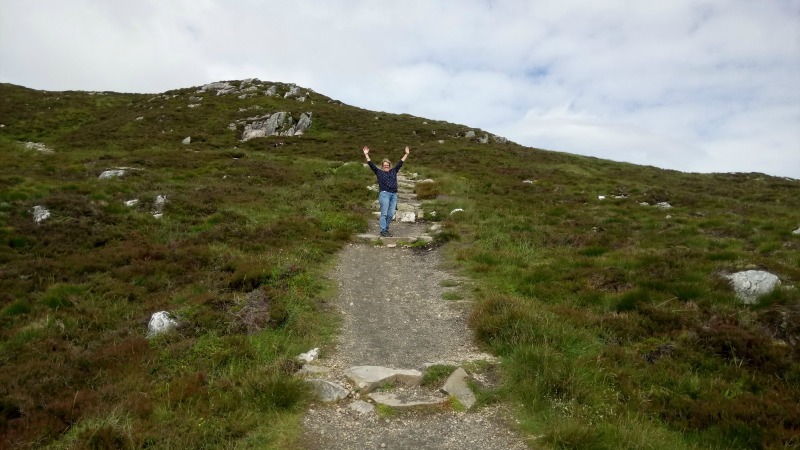 It was a classic JWalking adventure Mayo, we loved it although felt it the next day bigtime. The hobbit did unbelievably well at the top on those almighty rocks, especially as she doesn’t really like heights that much. Congrats to you too. Not sure how people get to ‘bag’ all 282 munros but we were delighted with just one.